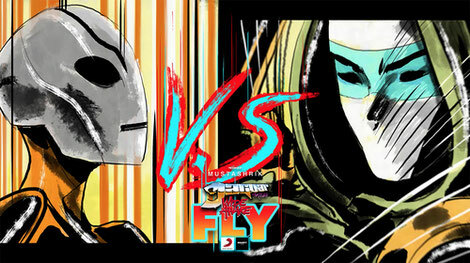 Jaguar Skills recently revealed the animated music video for his new track, ‘Are You Ready To Fly?’, which features Wide Awake. The video is directed and produced by award-winning Mustashrik, who will be providing live visuals for Ed Sheeran at the Brit Awards tonight. The video is a hyped-up creation that pays homage to the arcade video-game and anime classics of a specific millennial generation: from fun interactive dance games, to intergalactic alien heroines and mecha-robots. Jaguar Skills is a popular UK DJ thanks to club and festival appearances and mini-mixes encompassing music from every genre going – but 2016 saw him evolve into a producer too. ‘Fly’ is possibly his most impressive work to date. Produced in collaboration with CJ Beatz & Jordan Crisp aka Wide Awake, it builds to a crescendo through florescent synths and a vocal before dropping into a chugging, Moombahton-infected beat. ‘Fly’ is out now Viper Recordings/Insanity Records.